If your Wi-Fi network doesn't quite reach the top floor or the backyard of your home, we have a solution for you. If your Wi-Fi network doesn't quite reach the top floor or the backyard of your home, we have a solution for you. 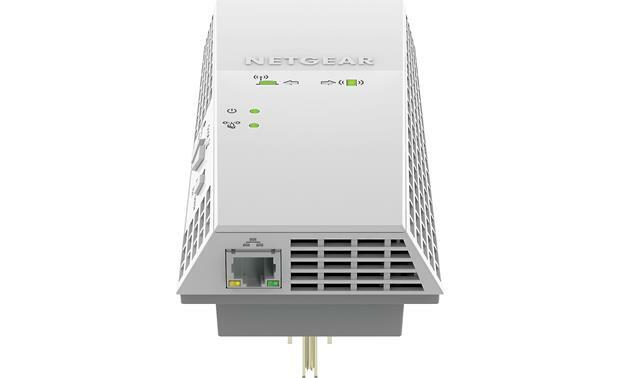 The NETGEAR AC1900 Wi-Fi extender is an easy way to boost the range and signal strength of your existing wireless router. Simply plug it into the wall halfway between your router and your poor coverage zone. A quick browser-based setup on your computer or a mobile device is all you need to make your network reach further with faster speed. All of your devices will enjoy better signal strength, faster downloads, and more consistent music and video streaming. My wireless router had a hard time reaching one of the bedrooms in my home. To find out how well wireless extenders work, I took one home and put it through its paces. Check out the results here. Helped get rid of a lot of "connection" headaches, & sped up internet. Very satisfied!! How far from your router can you plug in the extender please? I believe the range between the router and the extender is approximately 15-20 feet. Also my router is located in a closet. 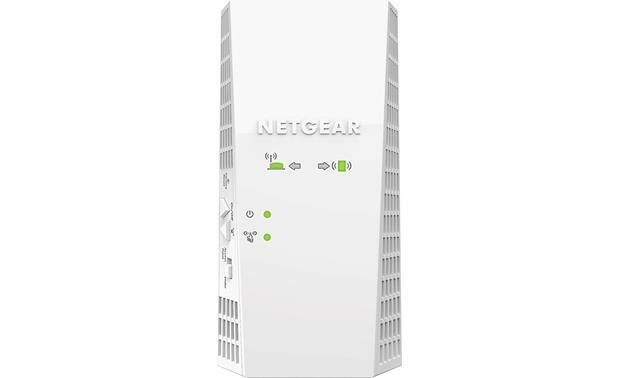 Robert W.
WiFi Range Extender: NETGEAR's AC1900 Dual Band WiFi Range Extender (EX6400) boosts your existing WiFi and delivers greater wireless speed and coverage to where WiFi signals are weak in your home or office. It works with any standard WiFi router to deliver dual band WiFi with up to 1.9Gbps. The AC1900 WiFi Range Extender delivers fast WiFi speed and connectivity for smartphones, tablets, laptops, computers, and more. 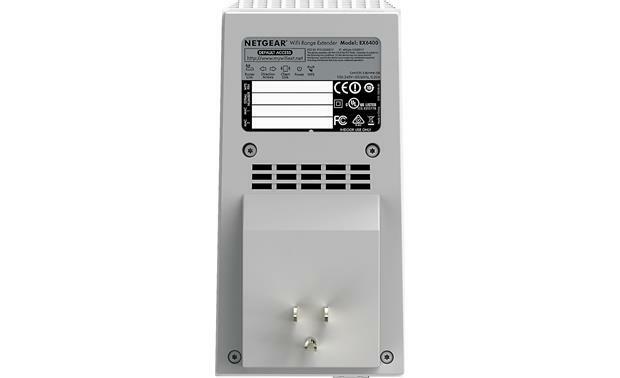 A Gigabit Ethernet port provides WiFi connectivity to a wired device like Blu-ray players, game consoles, smart TVs or streaming players over your existing WiFi network. Applications: Add this WiFi Range Extender to improve your home's WiFi and get better connections for your tablets, smartphones, laptops and more. Its ideal for HD video streaming and gaming. 802.11ac: The extender supports the 802.11ac networking standard. This new standard offers better speed, improved reliability, and more range than older WiFi networking standards. The extender is also backward compatible with earlier WiFi a/b/g/n standards. However, to get the benefits of 802.11ac, your WiFi router must support the 802.11ac WiFi networking standard. In comparison, the latest 802.11ac WiFi standard is 3x faster than the older 802.11n WiFi standard. 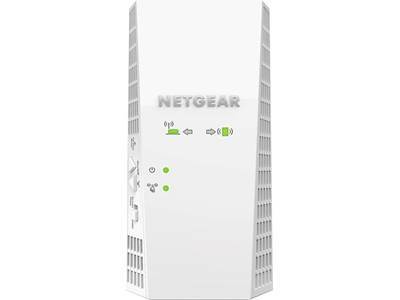 Dual-Band WiFi: The NETGEAR AC1900 features dual-band WiFi with up to 300 Mbps for 2.4 GHz network and 1733 Mbps for 5 GHz network. FastLane Technology: FastLane technology improves performance using both WiFi bands. Get the most out of your HD entertainment with FastLane technology. With FastLane technology, the extender connects to your router using one band and connects to your devices using another band. Because a band is dedicated to each function, performance is enhance. FastLane Technology is ideal for HD streaming & online gaming. When you enable FastLane Technology, two options are available. Use the 2.4 GHz band to connect the extender to the WiFi devices and use the 5 GHz band to connect the extender to the WiFi router. Use this mode if your WiFi router supports the 5 GHz band but the devices that you want to use for gaming and streaming support the 2.4 GHz band. Use the 5 GHz band to connect the extender to the WiFi devices and use the 2.4 GHz band to connect the extender to the WiFi router. Use this mode if the devices that you want to use for gaming and streaming support the 5 GHz band but your WiFi router supports the 2.4 GHz band. Note: If all your devices and your WiFi router support only the 2.4 GHz band, or all your devices and your WiFi router support only the 5 GHz band, do not enable FastLane Technology. 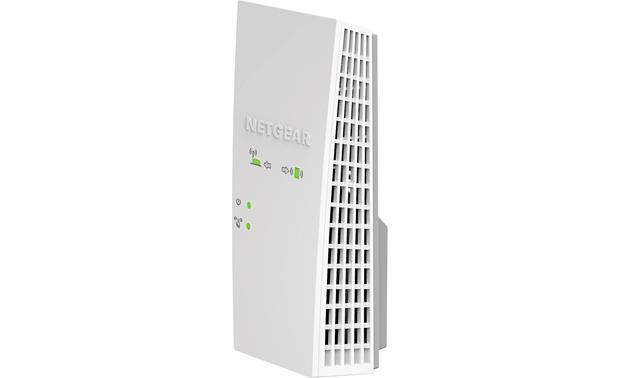 Two WiFi Modes: The AC1900 can connect to your network's WiFi signal and then boost that signal or it can connect to your network with a wired connection and work as an access point. You use the Access Point/Extender switch on the side of the extender to select which way you want to use the extender. Extender Mode: In Extender mode, the extender connects to your existing network's WiFi signal and it rebroadcasts two extender WiFi signals, one in the 2.4 GHz band, and another in the 5 GHz band. When you are too far away to connect to your network's WiFi signal, you can connect to an extender WiFi signal instead. Access Point Mode: Access Point mode creates a WiFi hotspot using a wired Ethernet connection. You can use the extender in access point mode as a WiFi access point and create a new WiFi hotspot by using a wired Ethernet connection. Gigabit Ethernet Port: There is one RJ-45 Ethernet port (10Base-T/100Base-Tx/1000Base-Tx) with auto-sensing technology. This Gigabit Ethernet port is used to connect a wired device like a smart TV or game console to your home's WiFi network. Wall Plug Design: The compact wall-plug design allows you to simply plug the AC1900 WiFi Range Extender into any electrical outlet. Smart LED Indicator: A smart LED indicator lights up to help you place the AC1900 WiFi Range Extender for optimal boost in range and performance. WiFi Analytics App: Use the NETGEAR WiFi Analytics app on your Android (OS 2.2+) smartphone or tablet to get advanced analytics to optimize your existing or newly extended WiFi network. Check your network status, WiFi signal strength, identify crowded WiFi channels and much more. Flexible & Secure Setup: The WiFi range extender offers WPS & Web Browser setup. Secure WiFi connections offer the highest level of WPA/WPA2/WPA2-PSK security. WPS: You can use WiFi Protected Setup (WPS) to connect the extender to your WiFi router without typing your existing router's WiFi network name (SSID) or WiFi password. Web Browser: You can use a web browser to log in to the extender and set up its WiFi connection to your existing WiFi router. Firmware Updates: The extender is set up to check for new firmware automatically at login. Click here for the latest firmware/software updates from NETGEAR. How far from the router can you plug in the extender please? Lori, My router is in my family room on my first floor approximately 18' from my wired spotlight cam that is outside my basement door 1 floor down. The extender is approximately 1/2 the distance to the spotlight cam and in the basement on the same level as the spotlight cam. I have had no connectivity issues with the extender and it's placement. I hope this is helpful. 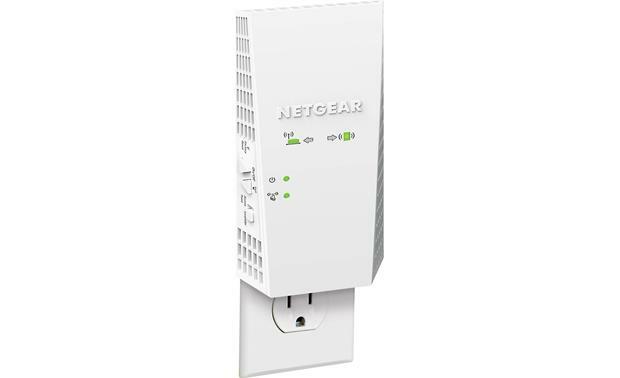 Searches related to the NETGEAR AC1900 Wi-Fi® Range Extender Essentials Edition 802.11ac Dual Band Gigabit (EX6400).